Dr. Hufham has been creating beautiful smiles in the same office location in Birmingham since 2001. He earned his Doctorate of Dental Medicine from The University of Alabama School of Dentistry (UAB) in completed specialized training in Orthodontics at The University of Pennsylvania, where he performed clinical research published in The Journal of Clinical Orthodontics. He is a member of The American Association of Orthodontists, The Southern Association of Orthodontists, The American Dental Association, and The Birmingham District Dental Society. 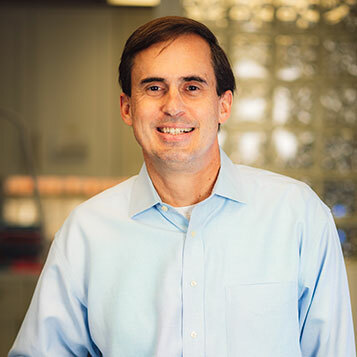 A recognized leader in his profession, Dr. Hufham is a third-generation dentist, and his father practiced orthodontics in his hometown of Dothan, Alabama for over 25 years. Dr. Hufham and his family are members of St. Luke’s Episcopal Church, where he has served on numerous committees and served as Senior Warden. He is a present board member of BigTime Ministries and The Mountain Brook Sports Corporation, and past board member of Pre-School Partners, MPower Ministries, and The Mountain Brook Chamber of Commerce. Away from the office, Dr. Hufham enjoys spending time outdoors and playing tennis and golf. He and his wife, Joanna, have three children: Anna, a college student at Yale University, and James and Henry, students at Mountain Brook High School and Mountain Brook Junior High School, respectively.